Three Pepper Sausage Corn Cakes- pork sausage, bell peppers, jalapeño peppers and corn. Served with sweet chili sauce and sour cream. 1. Cook sausage in large nonstick skillet over medium - high heat 8-10 minutes or until thoroughly cooked, stirring frequently; drain. Return to skillet. Stir in corn; set aside to cool. 2. Combine water, 6 tablespoons butter, eggs, red pepper, jalapeño pepper, onions, cilantro and black pepper in large bowl. Stir in sausage mixture. 3. Mix cornmeal, baking powder and salt in small bowl. Add to sausage mixture; mix well. 4. Heat 2 teaspoons of the remaining butter in skillet over medium heat. 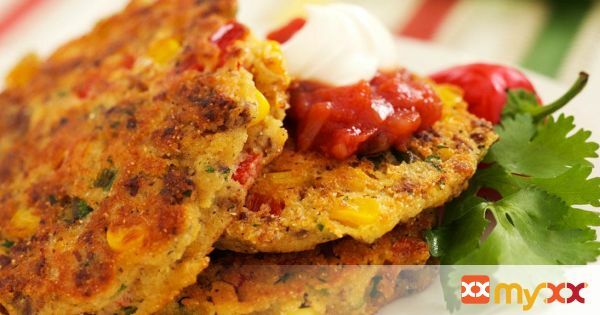 For each corn cake, pour a generous 1-tablespoon batter into skillet; cook 2-3 minutes or until edge is slightly dry. Turn and cook second side 2 minutes or until bottom is golden brown. Stack corn cakes on a heated plate; cover to keep warm. 5. Repeat with remaining batter, using small amount of remaining butter to grease skillet between batches. Serve warm with a small dollop of sour cream and drizzle of chili sauce, if desired.